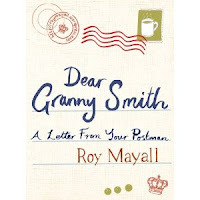 Roy Mayall is a postie writing anonymously about the demise of the British postal system. This is a slight book. A personal reflection on what it means to be a postman. He decries the corporate takeover and destruction of the Royal Mail. Through anecdotes of life on his round and recollections of former colleagues, Mayall paints a rose-tinted view of your postman. That's the problem with this book. I'm not sure I agree. In my experience postmen are surly types who don't appear to enjoy their job. Who leave a trail of red plastic bands scattered in the front garden. And on the pavement. And who fold up 'Do Not Bend' items and stuff them through the letterbox. Maybe it's because we live in London. That must have some occupational hazards. Unruly school children. Maniacal bus drivers. Dogs. People. Houses. Letter boxes. If only we had a Roy Mayall on our road. But hold on a minute. Towards the end of the book, it starts making sense. He stops harking back to the memories of yesteryear and starts to pin down exactly what's gone wrong. These final observations are at the heart of the debate of how much the Royal Mail is a national service and whether it can - or cannot - be privatised. And if you are going to privatise, do you do it properly? Or make a total pig's ear of it? With wave after wave of incompetent management trying to apply different models of modernisation without involving those who deliver the service. You never know, they might even be able to help. Oh and no prizes for spotting the crafty nom-de-plume. If you want to read the real day-to-day story behind the book, check out the blog.